✔All of the Crenova pruning shears adopted high quality materials and strict quality control. ✔The blades made with Ultra-fine Polishing Technology, very sharp and prevent tree pulp adhesion caused by rust on the blades. ✔Handle material is high quality Aluminum and wrapped with a layer of Sponge Case, very soft and comfortable to use. Garden is often the father of pleasure! Be a good partner for your garden work! Safety & Handy Lock--The lock of our hand pruners can be free with a single hand, safe and convenient. Strong And Easy Working--Garden shears pruner is perfect for woman and small hands in family. Crenova Professional Pruning Shears, Enjoy Life Loving Gardening. - Quality blade made of Ultra-fine Polishing Technology. ★ With a bypass cutting tool, you draw a curved or straight blade past another blade - this creates a scissor-like motion that works well for cutting live green plants. The spongy, firm outer wall surrounding the stem yields easily to that bypass motion. ★ With an anvil cutting tool, you bring down a straight blade against a wide anvil usually made of steel or hard rubber. Crenova pruners are better suited for dead and dried-out plants. ✂【HIGH STRENGTH SK-5 CARBON STEEL BLADES】: Our pruner shears have a thicker blade made of Premium 65mn Titanium steel with Ultra-fine Polishing Technology and Teflon Coating, Make cutting more faster and powerful. The Garden Shear is Low-friction, Anti-corrosion and Rust-proof, Healthy for shears and branches. ✂【MORE DURABLE DESIGN】: Different with other pruner shears, our garden pruner has a high quality compression spring, through 30,000 fatigue tests and 10,000 non-deformation endurance tests, more durable, Perfect ideal for cutting up to 3/4-inch thick branches and flowers. Sap groove design to help keep pruning shears from sticking by channeling off sap. ✂【ERGONOMIC COMFORTABLE DESIGN】: Ergonomically Designed non-slip Aluminum Handles are Strong, Lightweight and Comfortable. 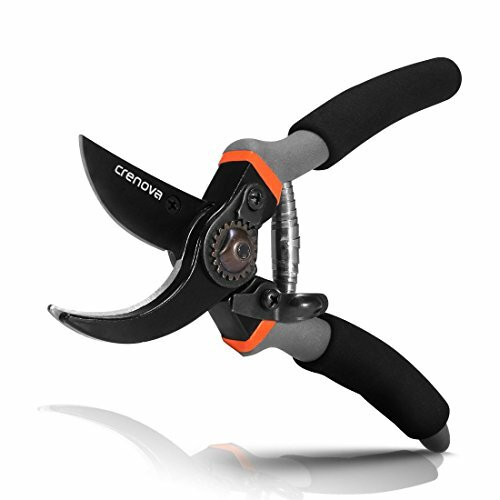 You'll appreciate the way that a Crenova pruner will reduce wrist strain, require less pressure to cut, and generally make the pruning experience much more enjoyable. ✂【COMFORTABLE SPONGE HANDLES CASE】: Provide a Comfortable non-slip Sponge Handles Case and Hence reduce stress on your wrist, Make you feel so comfort while cutting, easy to grasp, non-slip and effortless. Ideal Choice. ✂【100% RISK FREE GUARANTEED】: We offer a lifetime warranty with Crenova pruner. In the unlikely case of any quality problems, please don't hesitate to contact us and we will get back you as soon as possible. Our customer service record is unmatched!